Many of our customers are DIY Brides, but not all…some of our customers simply use our flowers to Brighten the Days of others, and we couldn’t be more proud! “The idea began in August of 2008 when I was in my second year of living with my husband in Deerfield Episcopal Retirement home in Asheville N.C., and realized how much volunteer work was being done by residents. I commented to those in charge of dinning services that real flowers would look so much better on the 35 tables in the dinning room. They looked skeptical because the idea had had a short run just a few years earlier. But they shrugged and said go for it. So I did, with two helpers, creating arrangements from flowers from local garden services, leftovers from funerals and other events. 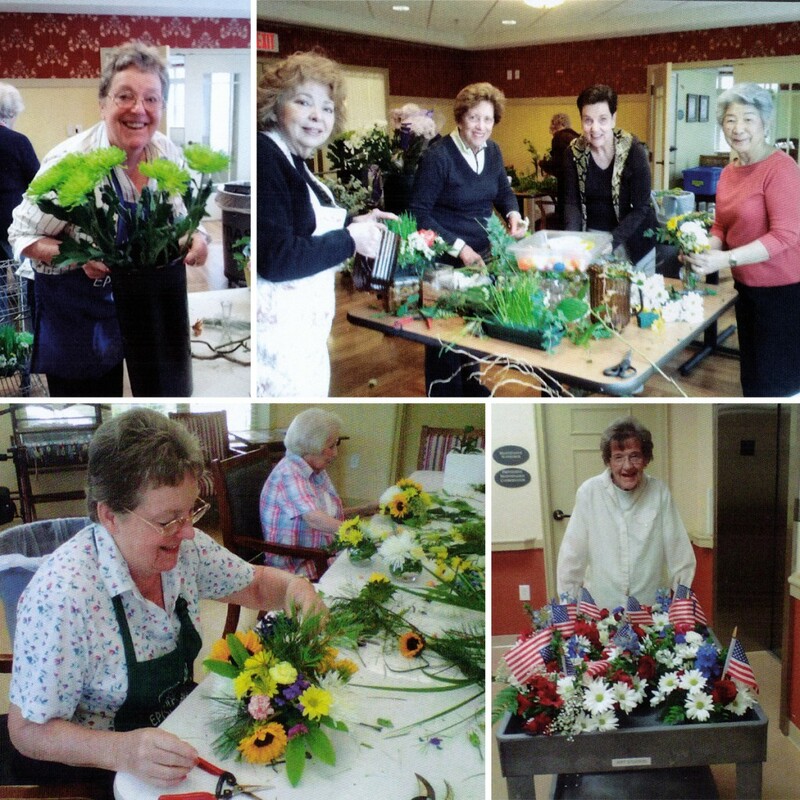 Residents loved the change and began to make contributions for purchases of containers, flower food, and more flowers from shops. The BLT girls were having a good time and a new Deerfield activity had been born for Saturday morning. It grew to 5 helpers, the word and joy spread. We gather to scrub containers, cut foam, giggle and tease each other…no one is ever fired…and always welcomed…No experience needed…you come and we will have a fun job for you. A few years later after the big Deerfield expansion, the dinning room had grown to 57 tables and a variety of flower services were providing products. There were special seasonal creations, a variety of containers and the team was being moved around like gypsies looking for a work station with light and water. We created outside, weather permitting, or in a room under construction for our spa, the Fiber Arts room, or if all failed, our condo turned into a flower shop. In 2012 three of my BLT girls had their spouses living in skilled care and were bemoaning the fact that their 50 tables never got flowers. So I added Health Care to reach 107 tables on Saturday with runners pushing flower carts to locations and a team of “watering girls”. This year we will come to about $10,000 a year budget given in donations. Envelopes with incredible Thank You notes are in my cubby daily. The administration is overjoyed and so is marketing, which found that fresh flowers are a real selling point. 2012 was also about the time I began searching for more economical sources for flowers other than the local florists or garden shops…and FiftyFlowers was found. What a great group of people! And a good thing for our Brides to remember…Not sure what to do with all those flowers after your wedding or event? Check out local groups like this one, or donate to a local resident home or hospital…you’re sure to brighten someone else’s day!